Back in the '80s there were some Transformers toys you could buy anywhere, and then there were some that seemingly only existed as rumors, spotted by a friend's cousin's neighbor at a distant out-of-state Toys"R"Us. Such was the case with Jetfire, a towering elusive Autobot that few kids actually owned, but all yearned for. 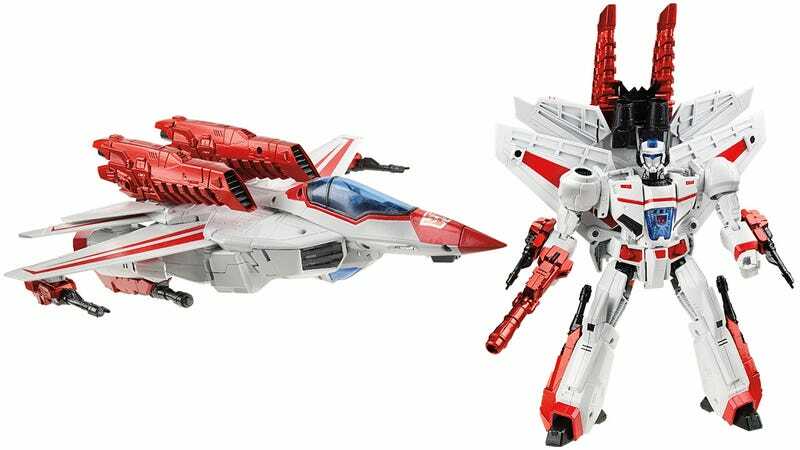 Some 30 years later those kids are now gainfully-employed adults happy to indulge the nostalgia of their youth, so Hasbro has released a new version of Jetfire that embraces the incredibly-detailed Transformers of today, while paying homage to the original version. First revealed at Toy Fair earlier this year, Jetfire is finally available for anyone trying to complete their childhood wish list. If you grew up a Transformers fan you'll remember that the original Jetfire seemed a lot different than Optimus, Bumblebee, and the rest of the Autobot gang. He was more complex, more detailed, and just more impressive than his compatriots. And that's because the '80s-era Jetfire was actually a re-branded re-issue of Takatoku Toys' wonderfully-detailed Macross VF-1S Super Valkyrie. Renamed Jetfire he was shoe-horned into the Transformers universe and immediately ended up on every kid's Christmas list.